LATEST NEWS: The new Ian Toms Trio CD, Playbook, has been nominated for ECMA Jazz Recoring of the Year as well as two Music PEI Awards: Jazz & Blues Recording of the Year and Group Recording of the Year. You can buy it at Back Alley Music, Indigo in Charlottetown, cdbaby (CD or mp3 verions), or on iTunes. Check it out for free on Soundcloud. 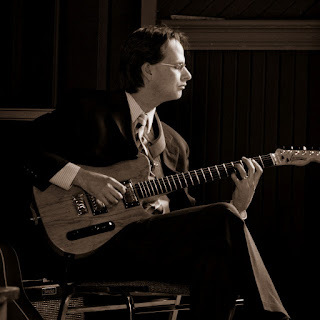 With influences like Jim Hall, Lenny Breau, Pat Metheny, & Grant Green, guitarist Ian Toms combines a strong melodic sense with a lush chordal technique. A graduate of McGill's Masters in Jazz program, he has performed with top-notch musicians including Phil Woods, Doug Riley, Pat Labarbera, Kevin Dean, & Mike Murley. Ian's debut album, OPEN, earned him 2 Music PEI awards as well as an ECMA nomination. He is a first-call session musician in his hometown of Charlottetown, Prince Edward Island. As a sideman, his work has been featured on over a dozen Music PEI awards and 4 ECMA nominations. Recently, he has performed with Symphony Nova Scotia, was the house guitarist for the 2011 ECMA Industry awards, and played for the Duke and Duchess of Cambridge, William and Catherine. Currently, Ian is promoting his new trio album, Playbook. Check out soundcloud to listen to samples from both albums! Ian uses Diamond Pedals and plays guitars by Denis Larocque and Brian Monty.